Now we come to week number two, in which the Cowboys showed that their performance against the Redskins may not have been as fluky as previously thought (by me, anyway). It was the first home game for the Cowboys in 2010, and it was pretty close throughout. This was the second of several close losses Dallas had this season. Here are some highlights from the game (although it’s mostly Bears-related). This clip shows much of the same plays that are in the previous one, except the good plays Dallas had are included. From what I see, turnovers and defensive lapses were what killed Dallas in this game. The Cowboys had three turnovers, while the Bears had none. The first two were interceptions thrown by Tony Romo that led to field goals for Chicago, while the final one, a fumble by Roy Williams, allowed the Bears to run a little bit of time off the clock in the fourth quarter. More importantly, Dallas was trailing by 10 at the time, and had been moving the ball pretty well before the turnover. Chicago punted after three plays, but Dallas was pinned back at its own 21 yard line and had to start over again. They did manage a field goal with under two minutes left, but the onside kick try failed, and the Bears ran out the rest of the clock. Now for the defensive problems. Looking at the first video clip, three plays stand out to me. First, at the 1:15 mark, the Cowboys allowed TE Greg Olsen to take a short catch and run free for a touchdown. He was uncovered, and no one was in a position to stop him from scoring. Second, at the 2:08 mark, was the 59 yard pass Jay Cutler threw to Johnny Knox. Johnny Knox makes a reception after getting past Mike Jenkins. It’s bad enough to give up a big play, but it was 3rd down and 15 from their own 21 yard line. Knox just blew past Mike Jenkins, and the Bears scored a touchdown a few plays later. Finally, the third play that made a difference comes at the 4:02 mark. It was a three point game, and Chicago had a 2nd and two play at the Dallas 41 yard line. Cutler threw a short pass to Devin Hester, who was wide open, and he got by Terence Newman for a big gain inside the Dallas five yard line. Chicago scored a touchdown on the next play to put the game away. With all of the bad plays on offense and defense, there were some good things to take away from this loss. For one thing, Miles Austin was doing a good job showing that what he accomplished the previous season was not a fluke, and he was the real deal. For the second straight game, he had 10 catches, showing that he can be a go-to guy. Unfortunately, this would be the last game of the season that we would see him catch so many passes. Another good thing to see was Dez Bryant scoring his first career touchdown on a punt return. 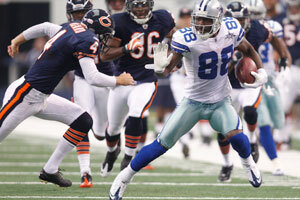 Dez Bryant scores on a punt return against the Bears. The rookie only caught two passes, but this play, which gave Dallas the first of two leads it would hold in this game, showed the kind of big play ability we hoped to see from him. All in all, it was a game that could have gone the other way, but mistakes again sealed the Cowboys’ fate. This is a bit off topic, as this is not a political blog, but since it is something about which Americans take a great interest, it should be mentioned. Also, it is a class assignment. Anyway, I will now present to you my thoughts about President Obama’s speech. Overall, it wasn’t a bad speech. It wasn’t anything more or less than what I really expected. He called for bipartisanship, and he stressed the need for controlled spending and job growth. That’s pretty much what I figured he would focus on. Some of it I agreed with, while some I didn’t. Whether or not any of his plans actually come to fruition remains to be seen, but there were some good ideas mentioned, like devoting more resources to education and investing more in energy. 10:12-Doesn’t know how we’ll reach that better place beyond the horizon, but he’s sure we’ll get there. The strength of our union is strong. At least he tried to impart a positive feeling at the end of his speech. 10:08-Our democracy is messy at times, but people in America wouldn’t trade places with any other nation. Different policies, opinions, backgrounds, but we all share the same dream as Americans. Again, he is reiterating the need for unity. 10:06-No American will be prevented from serving because of sexuality. Again, I’m not going to touch this one, as I don’t agree with it, but this video pretty much sums it up. 10:04-U.S. supports democratic aspirations of all people. The things we’ve fought for live in the hearts of people everywhere. This ovation is longer than the other ones. 9:58-He says the war in Iraq is coming to an end. America is working to become more secure to protect itself from Al-Qaeda. American Muslims are part of the American family. By preventing the Taliban from having a stronghold, they can’t form a base to attack as easily. In July, we’ll begin to bring troops home. I don’t want to know when the troops are coming home, and I especially don’t want terrorists to know, either. 9:55-He says government will make a website for people to see where money is being spent. People need to know when representatives are meeting with lobbyists. He says he will veto any bill with earmarks in it. John McCain is very pleased. I am, too. 9:53-Give people a more competent and efficient government. The president made a lame joke that everyone thought was hilarious. Merge and consolidate agencies to eliminate waste. It’s always bothered me how the government has multiple agencies that serve the same functions, so I hope they are able to make the government smaller. 9:50-Medicare and Medicaid factor the most into deficit. Need to bring down costs. Reign in frivolous lawsuits. Medical malpractice reform. Malpractice lawsuits are out of hand, so this makes a lot of sense to me. He says we need a bipartisan solution to strengthen social security for future generations. Don’t hurt people on it now or future people who will need it. This makes sense. Wants to cut tax breaks for the richest 2% of Americans. This does not. 9:47-Legacy of deficit spending going back almost a decade. We have to confront the fact that government spends more than it takes in. Government needs to live within its means. Wants to freeze annual domestic spending for next five years. Will reduce deficit by $500 billion over next decade. Cutting spending in defense, community programs, and other areas to save money. Make sure we are cutting excess weight, not necessary spending like investment. It won’t be enough to only cut domestic spending. This I agree with. Government spending is out of control and needs to be reigned in. 9:45-Obama says he wants input on how to make healthcare reform more affordable and doable. He’s not willing to go back to when insurance companies could deny coverage because of a pre-existing condition. Fix what needs fixing and let’s move forward. Don’t fight the same battles from last two years. I didn’t agree with the healthcare legislation when it passed, so I’m not going to get into this. 9:42-Wants Democrats and Republicans to lower taxes for corporations. This surprised me, given that he is a Democrat. 9:41-Obama wants to invest heavily in education, innovation, and infrastructure. I agree that these are all key areas that need addressed. 9:38-Obama said he wants better infrastructure. Roads, transportation, internet access. Wants to further efforts to bring more jobs to construction. 80% of Americans access to high speed rail in 25 years. In five years, high speed wireless access to 98% of Americans. I agree that America needs to address these kinds of issues, especially when it comes to rural areas like West Virginia, which tends to get left behind much of the time. 9:37-Obama said he wants to address illegal immigration once and for all. Doesn’t want to send people away who could help the U.S. He wants all to agree to make an effort to solve this problem. I don’t agree with his ideas on illegal immigration, so let’s move on. 9:29-In ten years, over half of jobs will require education past high school. 9th in proportion of young people with a college degree. 25% of high school students don’t graduate. This article says the U.S. is 12th out of 36 developed countries in college degree attainment. I agree that America needs to better educate children. We are consistently behind other countries in academic achievement, and there is no excuse for it. 9:27-Become first country with 1 million electric cars by 2015. Wants to eliminate dependence on oil-more biofuels and clean energy. By 2035, 80% of energy will be clean-goal. I like the idea, but it’s hard to say where we’ll be energy-wise in 24 years. 9:25-America will invest in biomedical research, information technology, and clean energy technology. Strengthen security, protect the planet, and create jobs. This all makes sense to me, if it will happen. 9:24-This is our generation’s “Sputnik moment.” He suggests this is America’s time to become innovators once again. 9:19-Obama makes a good point about how foreign nations are more competitive than they used to be with the U.S.
9:17-Obama says 1 million private sector jobs were created last year. The article I just cited says the U.S. has lost a net of 439,000 jobs since June, 2009. 9:16-Obama announces that the economy is growing, but America needs to focus on building more industry at home. This article from the Huffington Post suggests the economy isn’t doing as well as the government might lead us to believe. 9:14-A lot more clapping than I expected. 9:13-The President is using the Tucson incident to make a point about the need for American unity. I guess it works, but it could be viewed as taking advantage of a bad situation to make a statement. American unity does matter, though. 9:12-A nice gesture by everyone to acknowledge Representative Giffords’ absence. 9:11-He begins by congratulating Congress and new Speaker of the House John Boehner. That’s nice, since Boehner is a Republican and all. It’s probably just traditional to do it, though. 9:09-I don’t normally watch this, so it’s surprising to me that all of this is taking so long to get started. 9:06-I just saw a pudding commercial. Sounds good. 9:04-I wish this thing would get going. 9:01-Katie Couric is saying that Democrats and Republicans will intermingle, whereas they typically sit on opposite sides during this speech. I find this an interesting way of doing things. Maybe they’ll start to get along better? Probably not. 8:57-We’re now less than three minutes away from the State of the Union Address.